This is a top quality chrome plated Crescent wrench marked "MFG. BY CRESCENT TOOL CO. JAMESTOWN N.Y. 10 IN DROP FORGED STEEL MADE IN U.S.A. 22". No rust, some very minor wear on the jaws, mostly on the edges, a little chrome plating worn off, the jaws are straight and parallel on this heavy duty model adjustable wrench. The jaws are almost 1/2" thick at the widest point. 1.1" capacity between the jaws. Weighs 7/8 pound. A favorite heavy duty wrench among many! We generally have some replacement parts for this size wrench in stock also, sold seperately. 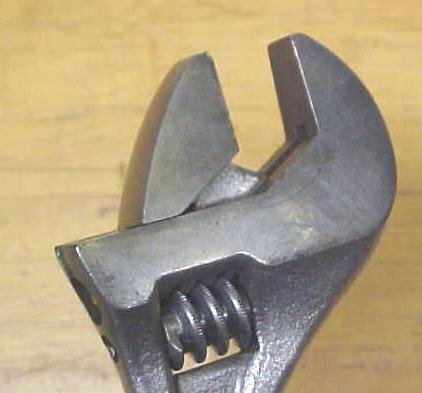 Items Similar To "Crescent Tool Adjustable Wrench 10 inch Chrome"